How would you like to gain the power to write your paycheck in life and dominate your competition? Who Else Wants a Quick and Easy Way to Generate Waves of Qualified Clients, Eager-to-Order Leads, and a Fatter Revenue Stream – Without Writing Checks to Incompetent Advertising Agencies and Employees … or Guessing at What to Do? If the idea of living on the world’s sunny white sand beaches and having more prestige and status thrills you … then you’re going to love this. Most business owners don’t realize it … but the words you’re using in your marketing act as the gatekeepers to how much money flows in. Use the wrong words in your marketing and it seems like sales and leads come in spurts or at best at a trickle … and you’re constantly in a state of hustling for business. Use the right words in your marketing and you can have a fountain of sales and leads bursting forth overflowing your business with revenue and spilling over your bank accounts into your investments and net worth. This the biggest business secret that most people miss. The words you’re using determine the degree of success or failure in your business. You know in relationships, if you say the wrong thing, all hell can break loose. If you say the right things you can have a wonderful fulfilling relationship. Business is about developing relationships with complete strangers … and cultivating long term relationships with new customers so they continue to hand you their credit card digits and refer friends and family to you. Business owners too often just hand their direct mail campaigns to an “all in one” print and mail service provider, to an SEO firm, or to some sort of marketing firm. Too often the results are dismal or are a fraction of what they could be receiving. You can’t put your future in someone else’s hands and hope for the best. You’ve got to take charge. That starts by understanding first the magic of words … and how if used properly they can persuade and influence people to write you a check or key in their credit card number. It’s because for 13 years I have served business owners in the United States, the United Kingdom, Germany, Australia, and Canada. By changing a few words on a website, an email, a sales letter, or a postcard the result is often times a massive increase in profits for my clients. For instance, one client of mine, an info-product marketer did $28,000 in one day from a promo I wrote for them. A mathematics tutoring school was floundering until I made their marketing more persuasive and VOILA – an extra $100,000 flows in. Another client became $1.2 million richer in three months after using the word magic I developed for their online campaign. Another client still saw a whopping $441,000 flow in one day from the selling words I developed for them. One of North America’s top sales trainers saw a doubling in sales after applying my sales copy to their flag-ship product. It’s for this reason that I’m paid as much as $12,000 plus royalties to develop more persuasive marketing campaigns for clients. The words I use for my clients turn that water faucet wide open – and water gushes out like a spring. Up until now, to get this kind of boost in business was hard to come by for most business owners – especially as more competitors moved into their market. Imagine not having to waste thousands of dollars on the incompetence of an agency or pull your hair out wondering why all that traffic to your website isn’t turning into as much profit as you hoped for … wouldn’t that be great? And wouldn’t it be great to turn up the selling power on your existing marketing that’s already working well? Introducing my 6-week, one-on-one apprenticeship program. Put simply, this apprenticeship trains you to take an existing marketing campaign that’s working fairly well and slather on some secret sauce (word magic) and increase your results. Also … you’ll be able to create your own mega-powered marketing campaigns at the drop of a dime … based upon the needs of your business. So let’s say you have a direct mail campaign you’re using that works fairly well to generate business and you’d like a way to generate more business from the Internet. You’ll gain the skills to enhance what works and open up a new channel for sales and leads. Suppose you have a website that gets a decent amount of traffic. Through this specialized training you’ll have the ability to ratchet up the amount of sales and leads coming through that website. This training is about giving you a new skill that empowers you to fatten your wallet … overflow your bank account and investment portfolio and induce your significant other to look at you with a new profound respect. It’s about gaining alpha dog status … not being the “beta-business owner” who constantly frets over month to month revenue reports. When you walk into a room … you’ll have a new sense of command presence. Your credibility and brand will be enhanced. It’s by developing the skill to craft words specific to your needs (be it direct mail, web pages, emails, etc.) that make your advertising irresistible. You know that if you have a world-class salesperson on your team, it’s like a license to print money. The words in your marketing are the same way; except better! That’s because you’re employing the power of leverage to reach more people than any one salesperson could. And once you have a suite of emails, websites, videos scripts, and direct mail assets – it’s like being able to write your own pay-check in life. It’s so vital you develop this skill too because relying on an advertising agency is like buying a car with a V-8 engine that only fires on four cylinders. You deserve better than that right? I think so and I think you agree. Frankly, many of these people annoy the heck out of me because they’re costing business owners in hard cash. And so many times I get called in to clean up their mess and the business owner has to cut a monster sized check to me on top of the previous person’s mistake. This is your business we’re talking about here, you don’t want to take those kinds of chances. The welfare of your business depends on how effective your selling words are. Finding someone who has competence in this rare art and skill is hard to come by. Unfortunately, my schedule is booked with a select group of clients thus I’m not taking on campaigns anymore. This New Skill Gives You More Control Over Your Business Revenues and the Ability to Upgrade Your Lifestyle! If you’re a big believer in the old adage, “Give a man a fish and he eats for a day. Teach a man to fish, and he eats for a lifetime.” Then you will see the magic in this apprenticeship. You’re going to gain control of your future outcomes in a way you never could before my friend. You’ll have a newfound power that you can instantly enact in your business at a moment’s notice. You’ll never again be at the mercy of an ad agency or incompetent consultant or employee. Instead of waiting weeks or days to have a consultant look at something – you can look at it yourself and know if it’ll work or not. You’re taking charge through the skills you’ll gain in this exciting program. As you’ll soon see, these skills can be transferred to other business activities you may want to embark upon in the future. That’s why it pays to layer on this new skill – it’ll make your personal stock rise … and grow you as a complete business person. What’s more, once you have added this ability to your suite of skills, you’ll become more attractive to future potential business partners. You’re getting the best tips, tricks, and techniques that put lightning bolts into your marketing. By the end of this program you’ll have three new marketing promos that you can put into action … PLUS … you’ll have added a new skill to your suite of skills for the explicit purpose of turning words into cash specifically for the needs of your business! Let’s chat about what this program is not. You won’t be taught how to become a professional copywriter or marketer. That’s not what this program is about. This program is entirely about giving you ninja-level persuasive writing skills specific for your business needs. This is NOT a cookie cutter program. It’s tailored to your needs. Thus if you’ve found that direct mail is what makes the money flow in, we’ll tailor this program around your direct mail marketing needs to turn up the voltage and consequently the profits. If you’ve found that email marketing is what makes the world go around for your situation, that’s what we’ll focus on. As mentioned, this is an accelerated training in powering up your skills many times over – so that your competitors will wince in fear when they see your new marketing promotions arrive on the scene. By the end of this program, you’ll have up to 3 sizzling marketing pieces developed. You’re being trained in how to develop your marketing campaign the right way – the way star-studded copywriters do it. My accelerated apprenticeship, “Turning Words into Cash” is just you and me on the phone together (or Skype) and working through email (possibly fax as well). You won’t have to elbow other students to get personal attention. I must warn you though, this is going to be one heck of an intensive program. Your training will span across six weeks, that way you don’t have to wait months to finish it. So you must be willing to invest time into our phone calls some of which will be an hour … maybe longer (at least 7), plus there will be email conversations and homework. After you sign up for this, I’m not going to just hand you a bunch of PDF’s to study and talk on the phone about it. No way. We’re Going to Drill These Skills into You so You Have the Ability to Write Your Own Pay-Check in Life! We’ll meet on the phone for the key parts of the course and you’ll take notes and I’ll make sure you understand what I’m saying as it’ll be a fluid back and forth environment. I want you to take notes so you ingrain this into your neurology. Handouts just end up collecting dust on someone’s hard-drive. This is serious business here. Granted, it would be supremely easier for me on my end to give you handouts, and do a webinar with students but I sincerely want to give you the best training program possible. My goal of which is to infuse these skills into you. Look – I could recommend 6 marketing books and tell you to read 7 money-making ads. You know what’ll happen? You won’t even make it through book #2 because you’ll get distracted by the demands of life. And what you read will soon be forgotten. It’s the same thing with looking at someone’s money-making ad. 24 hours later you’ll forget most of what you saw and won’t derive LASTING VALUE from it. Could you learn Kung-Fu from reading books? No, not really. You need to translate that into sweat and hours spent drilling punches, combinations, and sparing. That’s what we’re going to do. Think of me as your Kung-Fu trainer. Together we’re going to develop your skill. It’s going to be tough because you will do a lot of homework (it won’t be excessive) -- it’s going to require effort but it’ll pay lifetime dividends. As such, this program is going to require a decent investment. If you expect to develop these skills in 6 weeks you can’t expect an investment of $39 or $197 or some such rubbish. You’re getting my personal one on one time – a real pro who is paid as much as $12,000 plus royalties for a promo. To become considered for the “Turning Words into Cash” apprenticeship program, your tuition is just $2,997. I know I can charge far more than that as I’ve had entrepreneurs in the past wave ten grand at me. My goal is to incrementally raise my rates to see how many people I can bring into the program at the highest tuition rate. Based on initial feedback I believe $9,997 is definitely a reasonable amount – due to the lifetime value this apprenticeship offers. I’m really apprehensive about offering any money-back guarantee because I’m compressing 13 years of my experience of in the trenches campaign development into 6 weeks. You’re getting cream of the crop info. Trade secrets if you will. But against my better judgment, you’ve got one week to decide if this is right for you or not. If you were to drop out before week two starts, then you’ll receive a full refund. Still, I’m more than confident once you step into the pool, you’ll be eager to stay in – you’re going to see the immense value this means for your life. Please though – this apprenticeship is NOT for people who can’t take instruction. If you’re a lousy student and aren’t serious about this … then this is not for you. Don’t take someone else’s spot who would appreciate this. And if you’re on your last dime or about to go bankrupt, then please don’t take advantage of this right now. If you’re teachable … you see the value in developing the skill of turning words into magic … and you can afford it and are willing to do the homework then we’ll have a wonderful time. To get into this exclusive apprenticeship you need to submit a check or money order. By the time we’re done with this program, you’ll have three marketing pieces you can put into action – that more than covers your investment. And like I said, we’re developing skill, not book knowledge which is easily forgotten so you’ll be able to take advantage of your new profound skills year after year to make the Benjamins ($100 bills) flow in. URGENT NOTICE: This Opportunity Might Be Closed by the Time You Call Me Due to Limited Openings! As you can imagine – since this is an exclusive one-on-one custom program I must limit the number of students enrolled. Currently the cap on students is at 5 a month. That said, if this sounds like something that excites you, makes the hair on the back of your neck tingle, and inspires you to see exciting possibilities and a brighter future where you’re in control – then welcome aboard. Contact me today to get started in the “Turning Words into Cash” apprenticeship. BONUS TRAINING #1: Discover design secrets that when applied to websites, direct mail, and other marketing – it boosts conversion rates! You’ll be treated to concepts such as the power of color, fonts, design schemes, text size, etc., that all plays a role in persuading and influencing people to do your bidding. BONUS TRAINING #2: You’ll be taught secret ecommerce tricks outside of word magic that’s proven to generate a blizzard of sales and leads for you! Just one of these can boost sales and leads by 141% overnight! When you consider that I’m paid $1,000 for critiques on promotions and being that you’re entitled to up to 12 of these critiques (not counting what we’ll do during the training program … you’re easily getting $12,000 in value for FREE! Do Your Sales Letters Follow The 25% Rule? Disclaimer: No marketing, copywriting strategy is absolute. For your particular business it may or may not work as described. All business is an at risk proposition. The author assumes no risk for your use of this information. 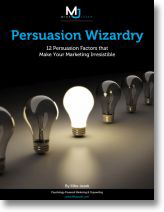 Discover 12 persuasion factors that can make your marketing irresistible and more profitable. Click the button below to claim your copy with my compliments plus another FREE gift. Wait... make sure you also contact me personally for your exciting samples and price quote email. Call or email to get it. First come, first served.